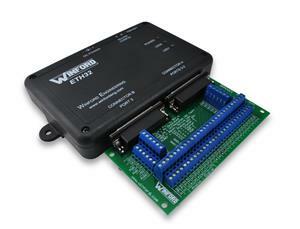 These breakout boards are designed specifically for Winford Engineering's ETH32 I/O Device. 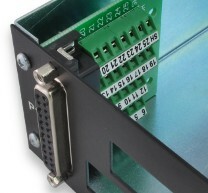 They provide quick, flexible, and convenient access to every pin included on the ETH32 I/O connectors. Each and every pin is brought out to screw terminals which are clearly labeled with the function of each pin. In addition, alternate pin functions are documented in the center area of the circuit board. Ground connection screw terminals are replicated all around the board to provide plenty of connection points. The BRKW01 contains two DB25 Male connectors which are spaced identically to the two DB25 Female connectors on the ETH32 device. 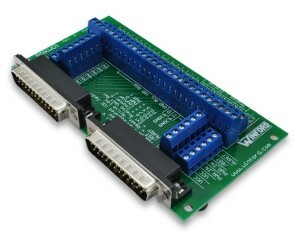 This allows the breakout board to be plugged directly into the ETH32 device without the need for any cables. Alternatively, extension cables may be used if desired. 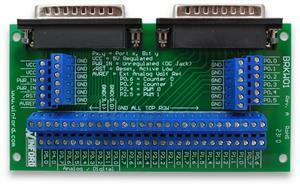 These breakout boards are perfect for prototypes or permanent installations, for the lab bench or for field wiring. The boards are available with two different connector hardware options: captive screws or jack screws. The captive screws work well when mounting the breakout board directly to the ETH32 device (without using any DB25 extension cables), while the jack screws work well when using a DB25 extension cable between the ETH32 device and the breakout board. See the Connector Hardware Options section below for more details. Captive Screws are male #4-40 screws coming out of the face of the connector to accommodate direct mounting to a mating connector which contains jack screws (see picture below). Jack Screws are the hex standoffs typically installed on DSUB connectors; they are threaded for #4-40 screws. Jack screws are perfect for connecting to a cable which has thumbscrews, for mounting to a wall plate, or for installing on a thin panel which has a DSUB cutout (see picture below).